Is creation a viable model of origins in today's modern scientific era? 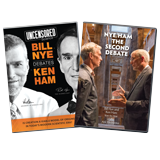 “Is creation a viable model of origins in today’s modern scientific era?” This 4-DVD set features Bill Nye and Ken Ham debating one of the biggest questions concerning the scientific community today. 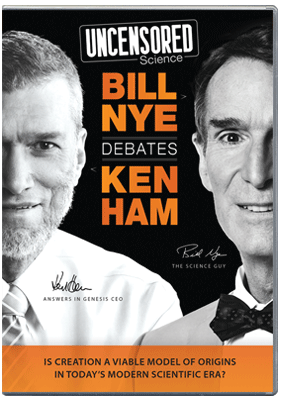 Includes a Post-debate Discussion featuring Ken Ham and Dr. Georgia Purdom. The live event was amazing! Order your copy now! 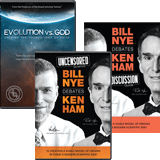 Leading creation apologist and bestselling Christian author Ken Ham was joined at the Creation Museum by popular TV personality and Evolution apologist Bill Nye. 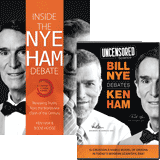 Ham, a former science instructor who emigrated to the USA from Australia over 25-years ago, was joined by the popular children’s program personality Bill Nye “The Science Guy” for this first and only-scheduled debate. Each man delivered what he believed was the best information available, then had an opportunity for rebuttal, and then answered questions submitted by the audience. Presented in a packed 900 seat auditorium, this event sold out in the first 2-minutes of online ticketing, and included an audience of Christians and non-Christians, creationists and atheists from at least 29 different states. This DVD (and the associated digital download) documents the actual, uncut statements, arguments, and reactions of these two leading spokesmen. You will understand the worldviews of each proponent, and those whom they represent, better than ever before. 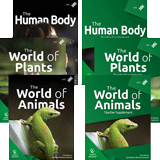 Order your own copy for your family to view again and again, and get extras to give to friends and loved ones who may not understand the foundational issues behind this extremely important topic! Order in bulk at our "outreach special" prices. Limited time! Disc 1: Opening Remarks and Ken Ham Presentation 45 minutes. Disc 2: Bill Nye Presentation and Rebuttal Session 52 minutes. Disc 3: Q & A Session and Bonus Features 54 minutes. 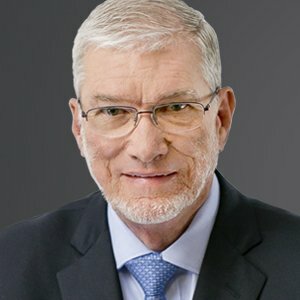 Bonus Disc: Post Debate Discussion with Ken Ham and Georgia Purdom 40 minutes. The CEO and founder of Answers in Genesis-US, and the highly acclaimed Creation Museum, and the world-renowned Ark Encounter, Ken Ham is one of the most in-demand Christian speakers in North America. A longer bio is below.